Health career awareness activities in collaboration with rural schools: Area Health Education Centers, Scrubs Programs, and K-12 Educational Resources. Recruitment and retention assistance provided by our workforce specialist, State Office of Rural Health, Primary Care Office, 3RNet membership, and Community Apgar Project. 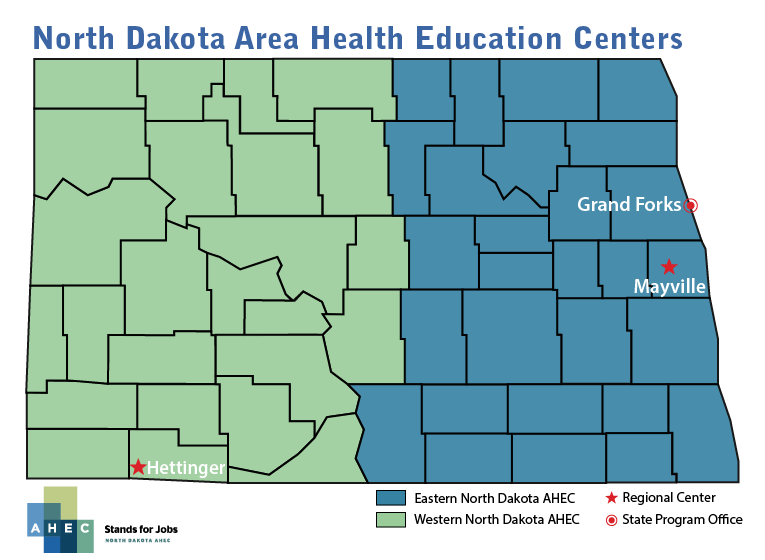 Continuing education opportunities for health professionals at the Dakota Conference on Rural and Public Health. Statistics, projections, and information about health workforce from the Rural Health Reform Policy Research Center, and our research team. Our director, Gary Hart, is a national leader in medical geography and health workforce. He leads our research team in collecting data to describe the current workforce of physicians in North Dakota. We use data to help inform policy makers and other key stakeholders. Our workforce specialist actively monitors workforce needs in rural communities and seeks out providers and health professionals to meet those needs. In-a-Box: Hands-on curricula ready for your classroom!